It is far more elegant with a French touch! The company Rogers & Goffigon is based in Connecticut and sales high quality home furnishing textiles. You will find in their collection beautiful woven fabrics made from natural fibers. It includes wool, horsehair, cotton, silk, hemp, sisal and more. Furthermore, Rogers & Goffigon has a catalog of leather and trimmings. And of course, you will find them in several showrooms across the United States and outside too. In the past, we had the opportunity to work with some of their fine wool cloth. We stretched this particular fabric in a corridor and hallway. I let you find the picture of this camel color cloth among the photos presented in this slider. The entrance has very nice pointed arched doorways. In fact, there are many designers of fabrics that we do enjoy. For example, Lee Sofa, Scalamandre, Donghia textiles, Boussac, Holland & Sherry, Rubelli, Pierre Frey, Ralph Lauren and so many more. 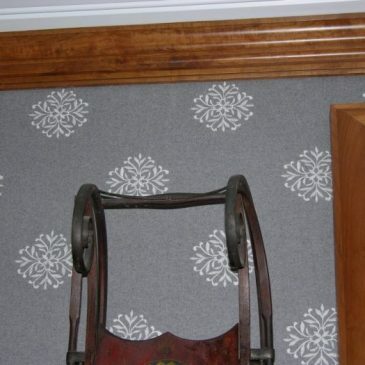 When you have a wall upholstery project, let us know about your fabric selection. We will tell you if it works well for stretching on walls.